Days after his return from a secret trip to visit rebels in Syria, Sen. John McCain, R-Ariz., reflected on the "terrible, unfair" fight he said is being fought in the war-torn country, and kept pressure high on the Obama administration to increase its assistance to opposition forces fighting the regime of President Bashir Assad. "They do not understand why we won't help them," McCain said in an interview with CNN, of the rebel forces with whom he met during his brief trip in the country. "When you look at the faces of these people and hear their stories, so many of them have lost family members. So many of them have lost friends. This is a pretty bloody, bloody business that they've been in." What are Obama's options on Syria? McCain, who has for months been calling for the Obama administration to provide arms to the rebels, acknowledged the risks inherent to such a step. Of the risk that U.S. weapons might fall into the wrong hands, McCain suggested "identifying those people who are on our side." "General [Salim] Idris has a very sizeable force. 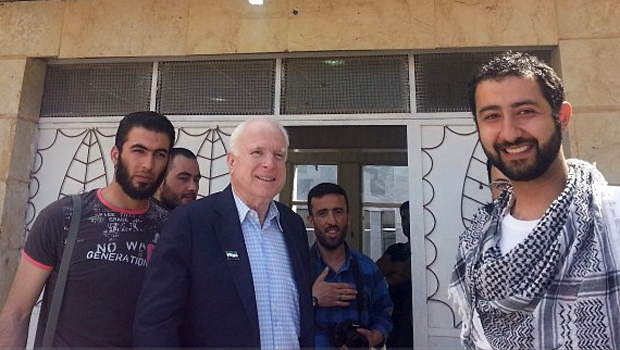 He has battalion commanders that he's in communications with," McCain said, of the leader of the Supreme Military Council of the Free Syrian Army coalition of rebel groups, with whom he met. "Is it a perfect organization? Of course not, because they're fighting as an insurgency. No insurgencies are perfect... We can help the right people. Is there some risk involved? Absolutely. But is the status quo acceptable?" The Obama administration has shied away from escalating its response to the ongoing violence in Syria, despite evidence that chemical weapons were used there in the past several months. Mr. Obama has insisted that he will not act on anything less than categorical evidence, making repeated allusions to the inaccurate information that drew the U.S. into the Iraq War. McCain has been among his most outspoken opponents on the subject, and he told CNN that since his visit, his feelings have only "intensified." "These are human beings that are trying to achieve the same thing that we have shed American blood and treasure here for well over 200 years," he said.